LibGuides – 150th Member Site! With the addition of Springfield Technical Community College this morning, the LibGuides membership has grown to 150 sites! Our community has grown by an impressive 60 sites since January, and we are expecting even better things for the remainder of the current school year. LibGuides would not be nearly this successful without the support of our excellent community members, so THANK YOU to all the LibGuides advocates out there. As the community grows there will be even more opportunities for innovation and the sharing of ideas – so please tell your friends, your colleagues – heck, tell your parents! We would also like to invite everyone to visit us at the Computers in Libraries 2008 conference in early April. Please stop by booth #214 to say hello and learn what all the buzz is about! Last week we had a few people ask if we could improve the layout of the book boxes within LibGuides. The development team really hustled this weekend, and we are happy to announce that the requested changes went live this evening. While there are some small changes regarding the layout, and the addition of an ISBN/ISSN field, the big change is the addition of cover art for each book added to LibGuides! 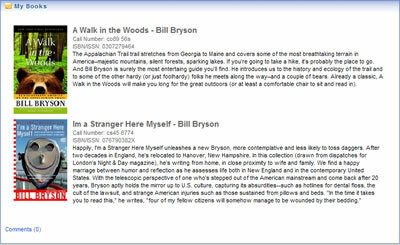 Here is a sample of the new box format showing two books from one of my favorite authors, Bill Bryson. We think the new format looks great and really makes the books stand out on the page – but the best part is that LibGuides will automatically locate and embed the cover art for you! 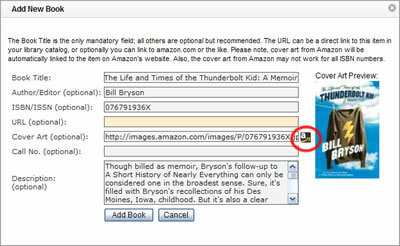 Just enter the ISBN number for your book, click the button we provided, and the image will be pulled from Amazon.com. You can also provide your own image URL if you would prefer; in either case you can preview the artwork right on the “Add New Book” pop-up. We hope you all enjoy the new layout – please keep the comments and suggestions coming by contacting us at support@springshare.com. We are thrilled to introduce a new chapter in the LibGuides (r)evolution – LibGuides community site, at http://community.libguides.com. You can also access this site by clicking on the “Community” tab on the LibGuides admin screen. The community site makes it possible to search guides of all our member institutions. Imagine the possibilities – a global community of thousands of cutting-edge librarians (2,500 as of March 2008), publishing useful content (4,800 guides and counting), sharing ideas, best practices, and collaborating on creating LibGuides. Here’s an example: Say you are a business librarian/liaison at the Upstate Memorial Library. You can log on to the community site and search for all business-related content at all LibGuides member libraries. You can search the guide titles/descriptions, subjects, tags, and guide authors. The full text search for guides is coming soon as well! It gets even better: now you have the ability share content within the LibGuides community. You can use *any* guide from any system as a template when creating your guides. LibGuides becomes a social network and a global community of librarian-created content. We’re psyched! And we hope you are, too! Here’s how to share content with other LibGuides librarians. Log on to the community site, at http://community.libguides.com. Check out Featured/Popular/Recent guides, or search for guides using keywords or by author. When you find the guide you want to use as a template for your own guide, contact the guide owner (their contact info is in the profile box on the right) and get their permission to use the guide as a template. It is very important you get the guide author’s permission first (you’ll see why, in step 6). When you log on to your institution’s LibGuides system to create your new guide, one of the options for the guide template will be “Use a guide from one of community institutions” (at the very bottom of the drop-down box for templates). When you select “Use a guide from one of community institutions” option, the pop-up will expand and ask you for the URL of a guide from another institution that you’d like to use as a template. Paste the URL of a guide you found in step 3. LibGuides will find this guide and copy its contents into your newly created guide. It will also send an email notification to the original guide owner telling them you used their guide as a template. Your email address, your institution, and the name of your new guide will be listed in this email sent to the original owner. The ability for our member libraries to share ideas and best practices in creating content, and then to share that content and collaborate with each other is something we think will be extremely valuable to our clients. It adds a new dimension to LibGuides and makes it even more useful. One final note – we have built triggers into the system (like email notifications to guide owners) when you use someone else’s guide as a template when creating yours. Please respect other people’s work and always check with the guide owners to make sure it is okay to use their guide as a template. We wanted to take a moment to highlight two of our newest community members, and the innovative ways they are using LibGuides to provide more than just subject-guides. Scottsdale Community College has both a “traditional” LibGuides system, as well as a second site which they are using as their library homepage. This allows the librarians to make website updates quickly and easily, without having to contact IT or a Systems Librarian whenever they want to add information to the library website. This is an interesting approach and one we expect to see more frequently as LibGuides matures with greater control of layout, customization, etc. The Burlington County Library System has an *excellent* example of how LibGuides can be used in a public library environment. Their system contains guides for K-6 research and homework help, cultural information for new U.S. citizens, local real estate information, cooking tips, and much more. We will definitely be pointing other public libraries to the BCLS LibGuides site as an excellent “getting started” reference. Widgets are the unsung heroes of LibGuides. They are a great way to embed your LibGuides into blogs, course management systems, social networks, etc. We’ve made an enhancement to the statistics package in LibGuides to enable you to track the number of visits to your guides from widgets. In other words, when you look at the statistics for an individual guide, you will be able to see how many visits came from the widget (as well as from the forthcoming API calls). See the screenshot below.